On the last Tuesday of each month, several RPG bloggers team up for Game Night Blog Carnival. We take a break from the standard RPG fare to cover our favorite board and card games. This time around, I decided to share my thoughts on Thunderstone. 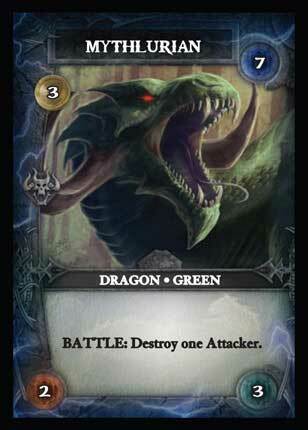 Thunderstone is deck-building card game. The deck-building genre has exploded due to the popularity of Dominion and all of its expansions. In deck-building games, players begin with a deck of basic cards, and obtain new cards which are added to their deck as the game progresses. In the endgame, each player’s deck has been tuned and focused like an engine in order to earn the most victory points. The variety of play and the short playtime of deck-building games has made the genre itself, and Dominion in particular, one of the hottest on the market. 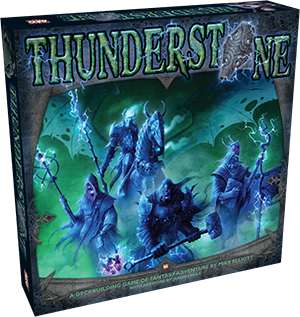 Thunderstone was released about a year after Dominion, and while it shares many of the same mechanics as its forebear, it also adds on a hefty dose of theme and flavor. Players in Thunderstone are tasked with obtaining the titular maguffin from the depths of a dungeon full of dangerous monsters. To aid them in their dungeon crawl, players must visit the village to recruit heroes to join their cause and purchase weapons, spells, and other items that increase their chances of victory. The game ends when the Thunderstone is found, and the winner is the player who has the most victory points, which are usually earned by defeating monsters. There are three basic choices for actions on a player’s turn. You can visit the village, and spend gold to buy a card to add to your deck. You can also head to the dungeon, where you can choose to fight one of three monsters that are revealed. Or, you can simply rest, and take no actions other than removing a card in your hand from the game. This is very useful for culling weak or even harmful cards from your deck. 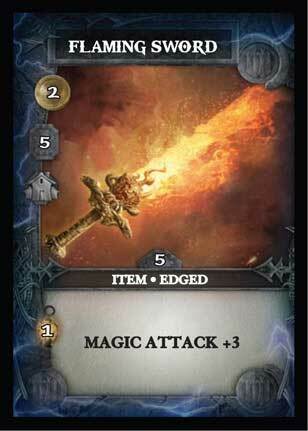 There are several different types of cards in Thunderstone, and each have different special abilities and values. Heroes, which are hired in the village, add to your attack power. Each hero has a strength value, too, which is used to determine what weapons (also purchased in the village) they can wield. Weapons, when equipped on a compatible hero, also add to attack value in a dungeon fight. Weapons and many other items in the game have a gold value, as well, which can be spent if you choose to go to the village. Powerful spells can also be purchased, and these have all manner of effects, ranging from the mundane attack power boosts to interesting deck manipulation strategies. Another “currency” in the game is light, which is all but required in order to brave the depths of the dungeon. As the game begins, all players have identical decks. Half of the initial deck is composed of Militia cards, which are the weakest heroes in the game. They add a mere +1 to the total attack value when played in the dungeon. The rest of the starting deck includes torches, which provide +1 light, rations, which add to heroes’ strength, and daggers, the weakest weapons at +1 attack. After a few rounds of hiring heroes, buying weapons and spells, and culling bad cards from your deck, a trip to the dungeon for some monster slaying is in order. In most situations, there will be three monsters available to fight, one for each level of the dungeon. Players must have 1 light for each level of the dungeon, or fight at a penalty of -2 to attack per missing light. When a player defeats a monster, they add it to their deck, move the remaining monsters up, and draw the top card off the dungeon deck to fill in the empty space. Somewhere in the bottom ten cards of this deck is the Thunderstone. When the monster one level above the Thunderstone is defeated, the game is over, and players count up their victory points to see who wins the game. As you can see, Thunderstone is a very complex game. There are many different variables to keep track of. It can be difficult to figure if you have enough attack, light, gold, etc. to do what you want to do. Adding to the complexity are the different special effects of each card. Certain monsters require magic attack, for example, which can throw a wrench in the works if you’ve not picked up any wizards or clerics. Some monsters destroy heroes, weapons, or spells that are played against them, so you must judge whether or not it is worthwhile to battle them. I personally enjoy the options, as it gives me something to think about when it isn’t my turn, but some may be turned off by it. Many of the special abilities are very flavorful, too; for example, thieves are a hero type that has a gold value, and archers get attack bonuses against monsters in the lower levels of the dungeon. It all works together for an intriguing, thematic game that moves along at a decent pace. 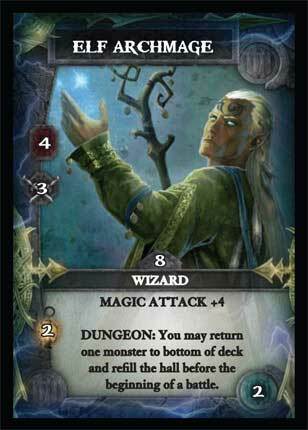 Thunderstone is my favorite deckbuilding game, by far. It has both excellent “crunch” (rules systems and gameplay design) as well as fantastic “fluff” (the artwork and the overall feel of the game). It has proven popular enough to spawn several great expansions, adding in new heroes, weapons, and monsters as well as new twists to the gameplay like traps and tough Guardian monsters who come out of the dungeon to wreak havoc. Thunderstone is a great game, easily one of my favorite releases in the past few years. If you can’t get your D&D group together, pick up a copy to get your dungeon crawling fix anyway!